The woman was ill and in grief, but too proud to admit it. She still refused to take to her bed as winter approached and her condition worsened. Soon she died and was laid to rest with those for whom she grieved. Nevertheless, if the stories are true, the lady’s restless spirit returns, though not to her home or the place she loved most, but to a nearby business establishment. Each day, a new clue will be posted until someone names the location, providing the street address, city and state (or province/country if located outside the US) and an explanation as to how each clue applies to the location. If no one correctly names the location, the contest will end at midnight (Eastern time), Saturday, December 15, 2018. Please note, the contest ends at midnight in the Eastern Time Zone. If you live in a different time zone, please make adjustments so you will know what time it ends where you are. 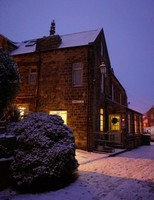 I could be wrong, but I think this is Weavers Guesthouse, 15 West Lane, Haworth, West Yorkshire, England, that is said to be haunted by Emily Brontë once a year, around the 19th of December 1848, which is the day that she died. The guest house was three weavers’ cottages that were joined and turned into a business. People say that Emily’s ghost has been seen and heard giggling, but those who have studied Emily, say she wasn’t the giggling type. She didn’t like leaving home and her favorite place was the moors that surrounded the village. When she was living, the guesthouse was three different cottages, where weavers and their families lived and the weaving was done at home. It’s possible that as the parson’s daughter, she visited people in the cottages if someone was sick or for other reasons. But if she came back as a ghost, it would probably be to the moors that she loved so much. If I’m wrong, I apologize. Thank you Julia, April and all others who congratulate me.